The Border Riders Club and Pittston Farm have been working on a trail system to connect and were waiting for the state to move the toll booth/gate. FINALLY, it is moved. Finally after weeks of rain or overcast skies (although I think we had more periods of sunshine then most of Maine) yesterday was hot, sunny and humid. I could do away with the humidity but by evening, the winds kicked up and it cooled us off. 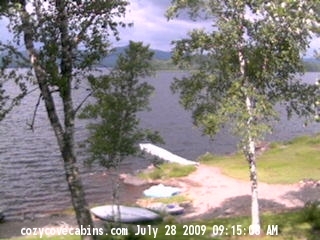 This image above is from our webcam this morning. Sunny bright and a little breeze. The weather report from Bishop-s Store is 78, humidity at 60% and wind speeds at 2mph. According to their chart we have only had 4.7 inches of rain this month so there is proof, we have not had as much as rain in our little piece of heaven. Well once again, I wait till the last day to write in the Journal! We had a wonderful time. We did so much this trip. Quebec City for a day, on the way home we saw at least 8 moose ❗ ❗ Went white water rafting, Kayaks, dinner, dancing, the pot luck picnic which is always great. Tami Steve and Murphy – thanks so much for everything. You always make us feel like part of your family. We will miss you guys so much until next year. Love ya. Before going home, Jesse got on the ATV and had to take another pose. We had such fun with these buddies while they were here 😀 Thanks Nancy, for sharing them with us. 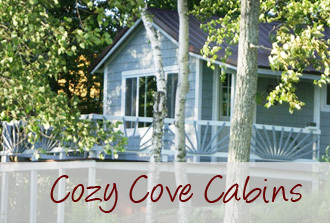 When you are trying to decide on a cabin here at Cozy Cove, many have asked about lake view and even “how much space between each cabin. If you have never been here before, we realize it is hard to imagine. So we took a couple snapshots from each of the cabins that are not “lake side” so you can see what you will see from your porch or deck. We hope this is helpful to you. Last night, the boys were out at sunset to enjoy a little campfire with us. Amos played a little guitar for me as promised. Jesse just roasted marsh mellows, his jug not far away. Luckily, neither got roasted themselves:wink: I do not think they realize they are made out of clay. It was very funny to watch this. We need a dog whisperer. Today was a glorious day in Jackman-first perfect sunny summer day in 2 weeks ❗ So Jesse and Amos decide to take the paddle boat out. They did not get too far but after the ride, Jesse decided he was too tired to move himself so I had to carry him back to his cabin 😆 He did promise though to play a little guitar later on. Wait and see. Now Jesse chose to hang out on the bench with his jug. Eventually though he needed to be carried up too.